When the wind came round to the north, we set off on the last 500NM to Richard’s Bay, South Africa. As we all had to time our departure for high tide at 5.30am, we set off together and sailed in close proximity with other boats for the time since crossing the Atlantic in 2003. Rather than rely on our SSB net to catch up on each other’s position, we could now see the other boats and chat on the VHF. Not only did this make the passage more sociable, it also made it that little bit more interesting as the boats kept an eye on ‘the competition’. Pamina did well: having started as the last boat to leave the anchorage, we nudged ahead of the fleet (including Eagle Wing – an historic moment!). We took an outside line from Punta Zavora to Punta St Lucia, which (by good fortune) meant we avoided adverse current and were able to make our course as the wind shifted to the south, unlike the boats closer to shore. Our arrival into Richard’s Bay once again coincided with some miserable weather (now wryly known as “Pamina arrival weather”). We had timed our arrival for early on Monday 13 November. With less than 20miles to go on Henri’s morning watch, first the wind began to increase and then, about 10miles out it began to rain very heavily. With the strong rain, visibility declined to less than 100 metres – a nerve-racking experience as Richard’s Bay is the World’s busiest coal harbour. In response to a query as to conditions in the harbour, the Port Control advised that it was safe to enter but that “it’s windy, and it’s rainy”. Fortunately, the wind dropped from 25kts to less than 10kts for the last few miles and visibility improved which made our entrance a lot easier. We went alongside the wharf in the small-craft harbour at Tutzi Gazi. The conditions deteriorated rapidly after we got in, one boat less than an hour behind us had gusts to 35kts and the last boat in, a few hours later, reported wind to 45kts. We all holed-up in a restaurant on the wharf for the rest of day, providing a break from the damp interiors of the boats as the rain continued to pour down. This was probably our longest lunch, starting as it did at 11.30 and ending about 12hrs later. Since leaving New Zealand we had sailed over 10,250nm in just over 4 months. We decided to leave the trip to Cape Town until the New Year and see some of the sights, such as game parks and the famous Drakensberg Mountains. We started out sailing the rhumb-line from Cap St Andre to Richards Bay, but when a south westerly of 25kts was forecast we decided to divert to Isla Bazeruto in Mozambique. It was a good decision, as the forecasted winds increased to 35kts. Having had light winds for most of the passage, we knew we would still be at sea when the winds came, but were hoping to duck into safety before the worst of the winds arrived. During the night before our arrival we had 10 hours of wind in the 25-30kt range. We put-up the storm-jib for the second time this year – more to save some wear on the ageing Genoa than because the conditions necessitated it. We made good progress overnight, sailing at 6-7kts, and arrived at the cape at the north of Bazeruto at 9am on Monday 6th November, an hour before the flood-tide. Having made it to Bazeruto ahead of the worst winds, we were initially relieved but then surprised by the unpleasant conditions inside the bay - there was little shelter from the strong southerly wind. The passage across the bay to the anchorage was very trying: the wind was directly on the nose, there were frequent ‘whiteouts’ during the heavy squalls when the coastline and islands only few miles away would disappear, and with over 20nm of fetch across the bay, the waves were steep and short. We took turns at helming and then ducking below deck to dry off, get warm and watch the charts. At one point, we considered heading back out to sea as the conditions inside the bay were so poor. Progress was slow – at times we were making only 1-2kts despite running the engine at full revs. Steering the boat in a straight line under power was very difficult, and very wet! At one point, Emma on Eaglewing called to advise that their anchorage (at Punta Gangareme) was sheltered in the conditions (they were registering gusts to 35kts) and we decided to stop there rather than continue to the other anchorage (Punta Mulidza) 5nm further to the south. We got into the anchorage at 14:00. It had taken about 5 hours to make the 12nm into the anchorage. Once we arrived we heard that the boats that had arrived the day before also had a tough time in the bay, at a similar point of tide, despite the fact that the winds were light. Exhausted from the 10nm of wave-bashing rather than the winds of the night before, we decided an early night was in order. The next day, we were rested and looking forward to catching up with our friends, most of whom had moved to an anchorage further south. With Eaglewing we sailed the five miles south to join the other boats and spend three enjoyable days relaxing, swimming and preparing a surprise birthday party for Chris and Theresa. The birthday party included dressing-up the birthday boy/girl in ‘silly clothes’ and team games on the beach before heading back to “LaFamilia”. Despite being low on ‘regular’ stores, the food was amazing because with only few days to go until South Africa everyone brought out the ‘hidden treats’ provisions. Starters were: Polenta-cheese triangles, fresh bread and humus, prawn crackers; the main courses: lasagne with spam, chilli con TVP, bean salads, tacos and tortillas. Also there were two cakes and two deserts – not bad considering most of us had last shopped seriously since July. We arrived in Nosy Mitsio on 10 October and anchored off a long sandy beach that stretched across a large bay. At first glance, Nosy Mitsio does not appear inhabited, as the main village is in a neighbouring bay and there are only two settlements hidden by the shrubs beyond the beach. There are no roads, vehicles or traffic and from what we could see neither electricity nor running water. It was a wonderful spot to rest and dry-off after our cape rounding. The golden beach, deep green water, red earth and dry heat made us feel we had arrived in Africa. We stayed two nights at Nosy Mitsio and then headed south to Nosy Be (“Nosy” means island in Malagasy, “Be” means big) to meet with our friends. We sailed along the coast, making two stops at Nosy Sakatia, a small resort island off the West coast of Nosy Be, and overnighted at Nosy Tannikelli, just outside the entrance to Nosy Be. At Tannikelli we had rendezvoused with Eaglewing whom we had not seen since May 2005 and had been trying to catch-up since setting off from NZ this year. It was a great reunion, we spent the day and evening talking, sipping ‘champagne’ we had saved for the occasion and admiring the many improvements Emma and Luke had made on Eaglewing during two seasons in Australia. The next day we sailed to Nosy Be’s main port/town of Hellville in order to clear-in. The town’s name, it turns out, is not descriptive, but rather is after a French Admiral named “d’Hell”. Nonetheless, we expecting the worst, as our pilot warns that Hellville famous for the “cunning and determination shown by port officials in pursuit of bribes and fictitious charges”. In fact, we saw nothing untoward while clearing-in (or out). The harbour is busy, full of local working sailboats, both lateen rigged “boutres” and square-sailed, double-sprit-rigged pirogues. The town is the administrative and economic centre of the island and correspondingly busy but also welcoming and friendly. There is a very good market, several bakeries (thanks to the French influence, we could have baguettes, croissants and brioche! ), one supermarket and several good shops where we were able to stock up on fresh produce and some dry provisions. Since the locals all speak French, it was easy to get by. A pleasant surprise were the many good local restaurants that serve fresh seafood and zebu steak (zebu is a local breed of cow that provides very lean beef). We quickly fell into a routine of eating out every lunchtime. Before leaving, we bought a 5 litre container to a shop where it was filled with rum for about 5 euro. We then crossed the road to the market where we added some local vanilla pods, following the prescription from one of the sailors we had met in Chagos. Perhaps the vanilla will mellow the rum’s taste with age, which at the moment seems to have considerable room for improvement. For only the second time this season we got some use from the bikes on board, doing a 40km cycle tour along the West coast of Nosy Be, which was a fantastic experience. It allowed us to see both sides of Nosy Be: the very exclusive resorts/hotels and restaurants catering for the tourists, as well as the many villages that are more basic than Hellville. Unlike Hellville which is built in concrete and has paved roads, all other towns consist of huts and most roads are unpaved. Bikes are a common mode of transport with the locals (we passed several puncture repair stands on the route), but not so common with tourists. Kids we passed were particularly amused by two white people on such strange bikes. The area around Nosy Be is a fantastic cruising ground where many weeks could be spent exploring beautiful anchorages. The winds are dominated by sea-breezes which start blowing on-shore some time around mid-day and fade with the sunset. Some trade-wind “leaks” across the island overnight, but these are generally light. When the sea-breeze starts pumping in the afternoon, the bay fills with large numbers of local working sailboats. After Nosy Be, we spent some time in the off-lying islands of Nosy Komba (home to many lemurs) and Tanikelli. We enjoyed short sails in strong afternoon breezes or day-hops with the dinghy in-tow, rather than the long passages we had been doing. On clearing out in Hellville, we spent one night at Russian Bay, and then sailed south to Nosy Kalakajero and Nosy Saba before reaching the amazing Moramba Bay where we once again met up with our friends (Eaglewing, Petrel, LaFamilia, Ciscnecito and Freefall). 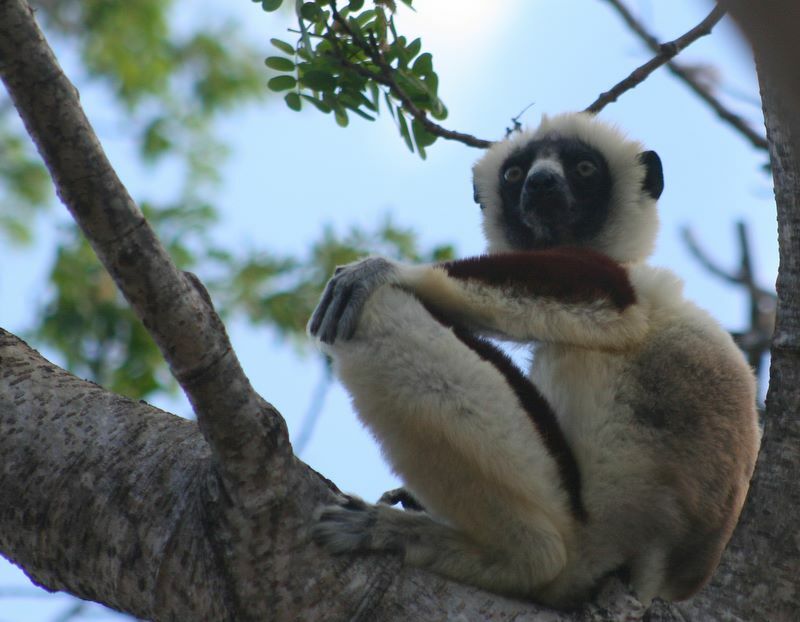 If we had known how spectacular, friendly, hassle-free Madagascar was, we would have arranged for friends and family to come out (there are flights from Milan direct to Nosy Be). Once again, we would have loved to stay longer by now it was late October and the Indian Ocean cyclone season had officially started. One tropical storm had already spun-up to the east of Madagascar, it was time to make tracks to the south. We left Moramba Bay on 30 October, sad to leave Madagascar but with plans to return for a chartering holiday some day. We greatly enjoyed our two weeks in Chagos. Now our preparations were completed and all we needed was some decent wind before heading off for Madagascar, our last stop in the Indian Ocean before arriving in South Africa. For the last two days, the winds had been light and in the south. We always want at least a couple of days with good winds in order to get a good start. On the third day the winds filled in as forecast and we were off on Friday 29 September. We left the anchorage off Takamaka Island and sailed quickly across the atoll for the pass. While I was standing on the bow as a look-out to check for coral, Henrietta put out the fishing-line. Before we got to the pass we hooked and landed a large trevally. About an hour later as we sailed south along the outer edge of the atoll, past the Saloman Islands, we caught a yellow-fin tuna. This gave us a great start on fishing and meant we could take in the line for a day or two. For simplicity's sake, our gear is basic, and not very "sporting", it invariably consists of a hand-line with 150kg nylon monofilament, a rubber-squid lure and a large double hook. A good start to the fishing then, but the first evening proved not so good for the sailing. Rather than the anticipated 15-20kts from the SE, by the evening the wind dropped to 10kts from the SE and first night was full of squalls. While the wind never went over 20kts, the wind direction was continuously changing, there was lots of rain and additionally the "holes" behind the squalls were hard to avoid. Progress was slow, so that in the first 24 hours we ended-up motoring for 6 hours and only made good about 100nm. Our slow start was in stark contrast to the friends we spoke to that first evening - they had left 5 days before us in their Swan 46 and had made good over 1000nm in that time, with a best day run of 220nm, a rate we could only dream of! 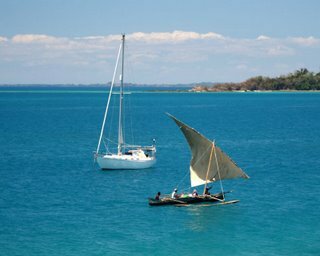 They gave us some good advice on threading though the large system of banks known as Saya de Malha on the direct route from Chagos to Cap Ambre, the northern most point of Madagascar. They had taken the narrow northern pass and described a period of 6 hours where the seas were dangerous with the top 2m of the swell breaking heavily. This confirmed our intended strategy of heading for the southern pass through the banks at 12 S, which adds about 50nm to the 1600nm passage. In the late morning of the second day, the wind filled-in from the SE, 15-20kts, and we were happy to be reaching in the trade-winds on a course of about 240T. For the next three days, we clocked up daily runs of over 165nm as the wind rose slightly to 20-25kts. Comfortable sailing, if a little wet as the swell was now breaking slightly and getting blown in to the cockpit. We looked forward to getting to 12S and turning west, after which we should be just as fast, drier and might even be able to get the twin headsails up. The twin headsails are our favourite set-up: they are comfortable, easy to manage and can usually be relied on to keep the speed up, if the trade winds are blowing. On Day 6 we had run 850nm from Chagos. We had reached 12S which is approximately the latitude of Cap d'Ambre, now 675 to the West of us. The winds were too far in the south to set the twin-jibs, which can usually be set at 135 degrees to the wind angle. We now had the South Equatorial Current behind us giving us another knot, so we continued to make good progress. The weather was pleasant. We had enjoyed clear skies with no squalls since the first evening. The days passed quickly, as we occupied ourselves with the daily routines of a long passage: fishing, preparing meals, keeping in touch with friends via a radio net and with family via onboard email, and getting weather fax and "grib" files. The moon was almost full and we looked forward to a few enjoyable nights as we approached the Cape. Cape d'Ambre, as described in the cruising guides and pilot, is a windy place with potentially heavy seas. A north flowing current runs on the western side of Madagascar and meets the South Equatorial Current in an area of over-falls to the north of the cape. The advice from East Africa Pilot is to stay a few hundred yards off the coast to miss the overfalls. In Chagos, we were been given similar directions from skippers who had previously done the crossing. During days 7, 8 and 9 it looked increasing likely that we would approach the Cape during the night - not desirable as we wanted to pass close to the shore. Our policy of avoiding unnecessary risk by not approaching land or entering harbours at night meant that on three of our four passages since New Zealand we have had to slow down to make daylight arrivals. We have found this surprisingly hard to do, sailing with reduced canvas is rolly in the ocean swell and heaving-too is equally rolly unless there is quite a lot of wind. On the evening of day 10 we were less than 70nm from the cape having continued our average daily runs of 150nm. In order to round at first light, we decided to keep our speed below 5kts and heave-too as we got closer to the shore. We anticipated a slightly uncomfortable night, but as we were only 50nm from the cape, we should be able to round at first light. Henrietta went down for her off-watch at 8pm. I kept the boat going at 4-5kts, reducing sail as the wind rose. During the next three hours, the wind clocked to the SSE and began to rise rapidly from 20kts to 40kts as we got within 40 nm of the cape. Initially I put the wind rise down to an acceleration effect around the headland, but when the next weather fax came through, the gradient wind was showing 40kts which was not shown on earlier forecasts. We knew then that we were in for a rough night. At the same time, wind and current became more parallel to the coast as we approached land. I altered course to the SW to try and offset the effects of these, bringing us onto a close reach. By the end of my watch at 11pm, we were getting 40kts of wind over the deck, but the seas were neither steep nor breaking. I did not want to heaving-too as we would rapidly find ourselves north of the cape in the region of the overfalls. We discussed what we should do for Henrietta's watch, and decided to hold our SW course for as long as we could, then tack to the east and return westwards in the morning to round the headland close to shore in daylight. I took half a Stugeron and went to sleep. One hour into her watch, Henrietta called me up. The wind now was now well over 40kts and occasionally reaching 50kts - some of the strongest winds we had experienced so far on our circumnavigation. We could barely hear each other as we shouted across the cockpit - only feet apart. The sea-state had deteriorated considerably during the last hour. Close to the coast, the shore shelves steeply: there is only about 5 miles between the 200m contour and the 1000nm contour. We were just within the 1000m contour and approaching the 200m contour. It was clear that we had to get back into deeper water in order to avoid the worst seas. We tacked back to the east and within an hour, the sea state improved. By my next watch at 3am, the winds came back to below 40kts. We had been sailing all night with heavily reefed main (an in-mast furling system) and roller-reefed jib. The main works well when heavily reefed as it acts almost like a tri-sail. The jib, however, is not so efficient when reefed down as even with the genoa car all the way forward, the leech is too loose. In order to improve on our sail configuration, we decided to set the storm-jib. To set the storm-jiib, we would first need to rig the inner forestay and reposition the dinghy which is strapped down on the foredeck during passage. Given the conditions, we decided to delay this work on deck until after day break. Once the sun rose, we repositioned the dinghy, rigged the stay and hanked on the storm-jib. This went smoothly, until a wave broke over the front of the boat and sent me sliding down the deck. As I lost my footing, I let go of the sheet I was holding and the bitter end shot overboard. When I tried to pull the sheet back, I found it was stuck. The sheet had wrapped on the freewheeling prop. I called out to Henrietta who was still on deck, struggling with her lifejacket which had inflated in the same wave. This was not what we needed! I quickly got a line rolling hitched onto the sheet and brought it back to a winch and tried to see if it would unwind. No luck, but at least it couldn't get any tighter. We've never fouled on our lines before, but ropes have got caught on our propeller twice before, while motoring in the Mediterranean. On those occasions in calm seas I went over the side with a knife. This time I left Henrietta (who had struggled free of the inflated life jacket and was wearing a spare) on the winch and went below to try and twist back the shaft by gripping it between the gearbox and the stern gland. As we couldn't communicate any longer, Henrietta would keep the line hitched to the sheet under tension and take up slack if any was made. It felt like a long shot, as I leaned into the locker and tried to get a grip on the shaft. We were fortunate, it needed three or four complete turns and the sheet was free. We could hardly believe our luck. Now we could concentrate on getting the storm sail set and getting around the cape. The storm sail improved the speed, trim and heel of the boat. Even though Pamina was launched in 1990 and we have sailed over 20,000nm since 2003, this was the first time the sail was used. Since the sail is rigged on an inner stay, the sheeting angle is much improved. 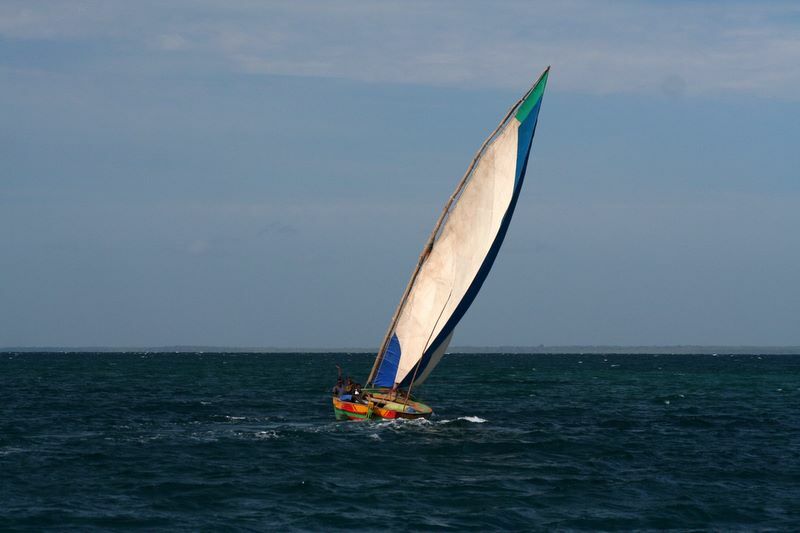 The shape of the sail is far better than the roller sail. In addition the weight of the cloth is much heavier and of course the sail is pristine. We would have put it up earlier, but were reluctant to set the stay during the night. We had tacked and were now heading westwards at over 6kts close hauled, making good speed towards the cape. I decided to stay outside the 1000nm contour and run the risk of hitting the overfalls, since we knew the sea-state in shallower water was likely to be dangerous by now. We eventually rounded with an offing of about 10nm, instead of the recommended 100 yards and saw no deterioration in the sea state. The wind backed as we cleared the cape and we were able to get more south into our course. It is possible to double a headland and see no noticeable effects on either side, not with Cap D'Ambre! Soon after rounding we were getting a lee from the headland and we were occasionally hitting 8kts in calm seas - under storm jib only. Some 10nm south of the headland the wind eased and we were happy to slow down as it was now dark. We were only 30 or so miles from our intended anchorage at Nosy Mitsio. The next morning (10 October) we sailed into Maribe Bay on the western side of Nosy Mitsio, and anchored in 6 meters depth opposite a beautiful golden beach. The calm anchorage, clear green waters and the near deserted beach provided a good spot for us to rest after the activity of the last 24 hrs. We were joined later that afternoon by Chris and Julie on the Swan who sailed from Nosy Be to meet us and looked after us very well by providing fresh produce, delicious dinners, great company over the next few days. We arrived in Chagos on 16 September, after a pleasant if slow passage from Cocos Keeling. Due to the light winds preceding our arrival we missed Eagle Wing and Petrel whom we had been 'chasing' since leaving NZ by only a few days. They had stayed 6 weeks in the atoll and delayed their departure to meet up with us, but left for Madagascar in a good weather window before our arrival. Chagos is an island group that marks the middle of our Indian Ocean passage. The group is a British Indian Ocean Territory, whose indigenous population was re-located. Part of the island group is now leased to the US who maintain a large base on Diego Garcia, in the south of the group and the rest of the group is administered by a British representative located at the base. Diego Garcia is off-limits for yachts, even in a genuine emergency yachts are discouraged from approaching the base (assistance will be "considered"). Chagos is famous amongst sailors as being home to a semi-permanent community of cruisers. Its location 5 degrees from the equator means that the island group is effectively not at risk from cyclones so that visiting yachts need not leave at the end of the sailing season to seek shelter elsewhere. Several yachts have stayed up to several years here, leaving the islands only for provisioning trips to the Maldives, the Seychelles or Madagascar. Chagos also has the reputation of being a desert island paradise, a place where sailors can live without the constraints and rules of the modern world. Of course there are some rules - regarding the duration of stay, prohibitions on spending nights ashore and regarding the erection of permanent structures on-shore, and also strict conservation rules (such as not hunting coconut crab nor spear fishing within the lagoon). The sailors who live here regard the islands as their village and spend some effort looking after the island. On first coming ashore and expecting a natural environment, it is therefore bizarre to see the dirt paths neatly swept and bordered by small sprouting coconuts. Some of the ruins on the islands have been adapted to the needs of the visiting yachts. There is now a 'yacht-club': a tin-roofed shed with rusty garden chairs and round table fashioned from drift wood, a make-shift fish cleaning table and bbq pit with 'library' facilities (a basket of books), beach games and a volley ball net. In addition, there is a well which is used for laundry beside which the old copra warehouse, its roof intact, is now used to gather rain-water into large tanks and for drying clothes. The long-termers are a sociable gang, not hermits seeking isolation as the image of a desert island paradise might suggest. In fact, the community of long-termers is quite active and their social calendar is like any other ex-pat community's - during the height of the season there are swap meets (boat jumble sales), home-made wine tasting sessions, regular pot-luck dinners, music sessions and even themed fancy dress parties. In the week preceding our arrival, most of the cruising yachts had moved on as it was approaching the end of the season. This meant that we had Chagos almost to ourselves, a rare occurrence as it can be busy at the height of the season with up to 60 yachts spread across the two anchorages. At the time of our arrival, three boats of the six boats at anchor were long-termers. The others, including ourselves and our friends on Cisnecito, were passing through. One long-term yacht, "Lady Guinevere", had only just returned from a provisioning trip to Male (Maldives) and would be spending the next 18 months in Chagos. Their provisions included 50kg of gas for cooking (most of their cooking and baking is done ashore using wood/coconut husks), an amazing 500 litres of petrol for the outboard engine for fishing, 100 kilos of sugar for the distilling of rice wine and seeds of spinach, peppers and cress for their on-deck vegetable garden. We spent the first few days anchored in the "pass" between Takamaka and Fouquet, beautiful turquoise waters, sheltered from the trade wind swell, but with a nice breeze. Ashore, Takamaka Island shows some signs of habitation, with an old well and the foundations of some houses visible. We then moved down to Boddam Island, the originally inhabited island which has many ruins, incl. a church, a jail, a graveyard, the copra warehouse, and several private houses. The buildings are so completely overgrown with tropical vegetation and trees that it is amazing to think it is only 40 years since people lived here. As Julie said, "It is very 'Lost'!" and any moment we were expecting the strange French woman to appear or an aeroplane to be found. While we were at Chagos, the BIOT officials came to clear us in. Whilst we had hoped to escape a charge of $100US (the fee for up to three months), it was interesting meeting the friendly and relaxed officials. They consisted of a group of British soldiers from Yorkshire in T-shirts and without any sun protection (very much Best of British squadies abroad), and the newly appointed Governor of the BIOT sporting a large hat and covered head-to-toe in light weight clothes and sun block (very much 'our man from the FO'). The marines travel between Diego and the other atolls on a former rig-support vessel known as "Pacific Marlin" which is also used for fishery patrols. The crew of the Marlin usually spend Sundays on Boddam Island for the crew's day-off. We were lucky to meet them there and spent a pleasant afternoon chatting to the crew (Scottish captain, South African engineer and mainly Bangladeshi crew), drinking their ice-cold beers and watching them play volleyball. At the end of the afternoon, one crew came up to Henri and said in fluent Greek "Why didn't you tell me you were Greek? I've worked on Greek ships for 15 years"! Most days we went swimming and snorkelling, caught up on boat jobs and laundry, relaxed with a book and generally had a great time hanging out with Julie and Chris. Once or twice Conor went fishing in the lagoon with Chris and caught rock cod and trevally which we bbq-ed ashore. Another day, the four of us smoked some bonito, trevally and an enormous yellow-fin tuna head. It took four hours to smoke the head and two for the fillets and the taste was fantastic. The snorkelling inside the lagoon is good but not as spectacular as Cocos Keeling. We once snorkelled outside the atoll, from the back of Boddam Island and saw the atoll "wall" dropping-off to ocean depths and another time snorkelled on the wreck of a yacht, wrecked on the coral only half-mile from our anchorage. The two weeks we spent at Chagos were very enjoyable: each day was a perfect holiday and most days ended with either sundowners or a bbq ashore. After Chris and Julie left, we spent three days at anchor on our own and enjoyed the perfect, desert island lifestyle for a few days. Whilst Chagos is very beautiful and although we enjoyed our stay, we couldn't see ourselves staying here for months - let alone years. There is simply not enough variety to keep us interested for long. And so after two weeks, we were ready to set sail and left Chagos on 29 September headed for Madagascar, the 'wild card' in our Indian Ocean Passage of which we knew little.